Kyody Villa has tall rooms with natural wood and stone décor. Artistic windows open up to an ocean view. There’s a balcony and outside barbeque, and equal bedrooms make Kyody Villa a good place for families that have older children. There’s even a formal dining room, so a romantic honeymoon with a sunrise view is in good order. A hammock adds to the atmosphere, but if you prefer to sleep inside, the bedrooms have partial air-conditioning. The nearest beaches are the Grand Cul de Sac and Petit Cul de Sac, so you can take your pick. 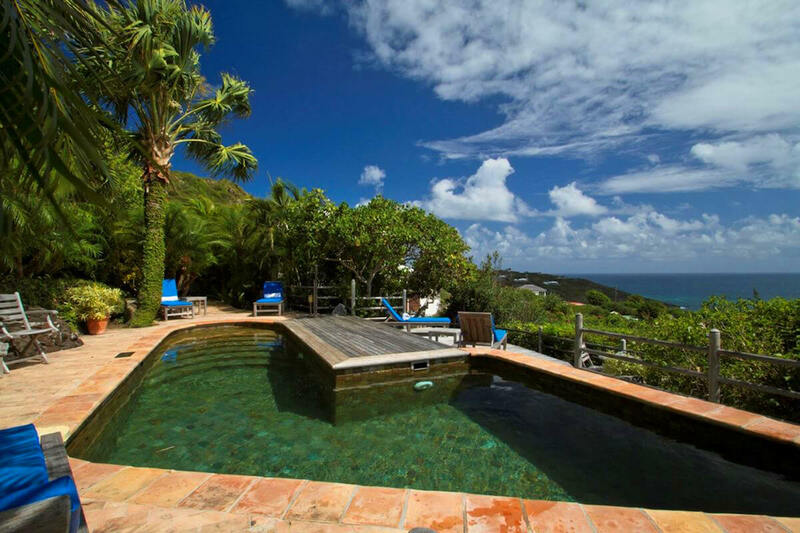 Kyody Villa was originally designed and built by Miles Reincke for Russian ballet superstar, Mikhail Baryshnikov, a long-time resident of St. Bart’s. Totally renovated, this two-story South American-style hideaway with the ambience of a manor offers two deluxe air-conditioned master bedrooms, each with its own bathroom and ocean views overlooking Grand Cul de Sac, Marigot, and Tortue Island. The living room and dining rooms are complemented by a rustic country kitchen overlooking the immaculately kept courtyard garden. Four totally unique outdoor patio decks surround the house and offer various views, outdoor dining, and plenty of sun or shade options. Kyody Villa’s secluded hillside location offers peace, quiet, and complete privacy, as well as providing for a constant breeze to keep the house cool in the daytime and at the ideal sleeping temperature at night. The hand-cut slate pool, resembling a lagoon, is located in the gardens, with palm trees, sun deck, and natural cliff side rock formations. The heat-absorbing quality of the slate, combined with a full day of direct sun exposure, make the pool both practical and fun to use year round. The pool and deck are both private and secluded. Kyody Villa is an extraordinary property and a second home to its visitors. Kids TV/VCR/game room; cell phone; 2 personal safes; US Satellite. TV, DVD and computer in the small room in mezzanine before bedroom 2. Nearest beach: Grand Cul de Sac, Petit Cul de Sac.